Tullman: Car dealers must take a broader view than 30-day sales cycles to stay relevant in the future. DETROIT — Robots will soon replace truckers, oil field workers and cashiers. Amazon can ship packages before customers actually buy a product. Uber can respond to calls for help faster than an ambulance. Yesterday's innovations are as fresh as day-old bagels and, by the way, the pace of change will be faster tomorrow than it is today. Technology advances are upending every industry, says Howard A. Tullman, executive director of the Ed Kaplan Family Institute for Innovation and Tech Entrepreneurship at the Illinois Institute of Technology, and car dealers must take a broader view than 30-day sales cycles to stay relevant in the future. 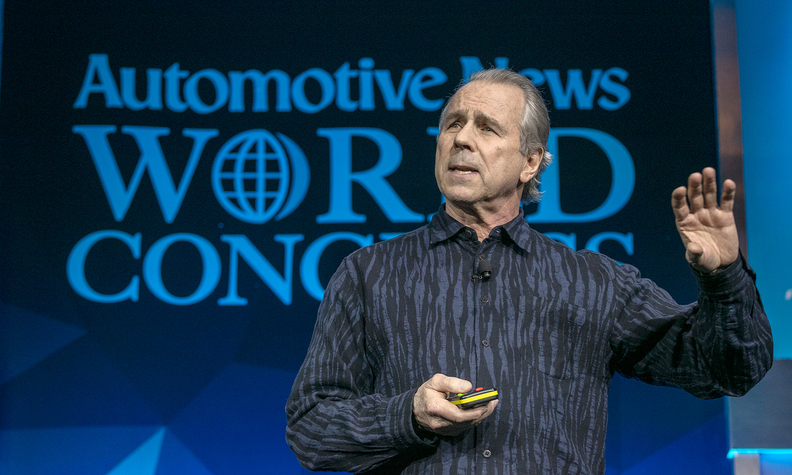 That was the message Tullman delivered Wednesday at the Automotive News World Congress in Detroit. Amid a frenetic pace of profound change in technology and consumer expectations, the long-time entrepreneur and general managing partner at investment firm G2T3V warned dealers and industry executives they must overcome a reluctance to change or else be swallowed by rapid economic shifts. "Every business is about the same thing — it's about speed," he said. "If you are not in a hurry, you are probably too late. We call this autocatalytic. The rate of speed is such that every time we turn around, things get faster. The question to ask yourself is not 'How fast am I going,' but 'How fast am I getting faster?' If industries around you are changing more rapidly, you are toast." Though IHS Markit data shows loyalty rates inching upward throughout the auto industry, Tullman took a dim view of reliance on loyalty, saying loyalty merely means customers merely haven't yet found a better product. In a world where the average consumer checks their smartphone 163 times per day, fickle is soon to be an understatement if it isn't already. Whether it's picking up preordered groceries or car shopping on their schedules, consumers are increasingly in control of these transactional relationships. "You don't get to drive the relationships; you've got to be there when the buyers are ready to buy," he said. "Blue laws? Give me a break. Most contacts come after traditional hours. If you are not responding to customers, you are out of luck. Their expectations are ramping up … and no one wants to wait for anything." As customers have more alternatives to traditional car ownership, the complications only potentially increase for dealers. But there's also some reason for optimism if dealers can pivot from legacy advertising methods and points of customer contact to new techniques that enhance engagement with core, high-value customers. Only 22 percent of consumers open email, for one example, but more than 98 percent open text messages. And there's a vast influx of new data streams that can help the car industry do everything form create more impactful advertising content to providing pinpoint services in connected cars. "We've got an enormous flow of data and information, and we have to make it useful and meaningful," Tullman said. "Businesses in the future will look at needs out there, and build systems that are responsive. Make it easy for customers, or they won't be there much longer."